Kaizen is a process of stepwise improvement. It focuses on implementing continuous change over time. The Japanese word KAIZEN means improvement. Kaizen is a popular word in industry, worldwide, to claim practicing innovative management methods. KAIZEN represents Work culture. KAIZEN represents for gradual improvement in day today work practices. KAIZEN encompasses methodology of PDCA cycle. PDCA cycle means Plan - Do - Check - Act. The focus is on Employee Involvement. Kaizen concentrates at improving the process rather than at achieving certain results. Every company employee is encouraged to come up with ideas. 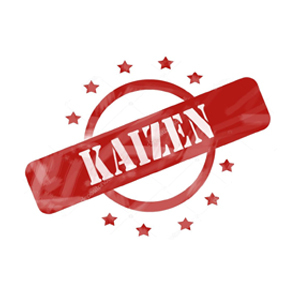 Successful Kaizens help build a Lean culture and measurably improve company performance. Methodology & Tools of Kaizen. Improsys's training program gives participants the knowledge required to implement kaizen and tools to improve continuously in future. Improsys's methodology is based on action learning model and real time project implementation. The Improsys's Kaizen Program give participants basics of Kaizen, its techniques and how to implement it in the organization for effective results. 1) Any individual who wish to learn JIT and its tools. 2)Any individual who wish to implement real time project. A-29, Jai Ganesh Vision, A wing, Ground floor, Akurdi, Pune-411035, Maharashtra, India.